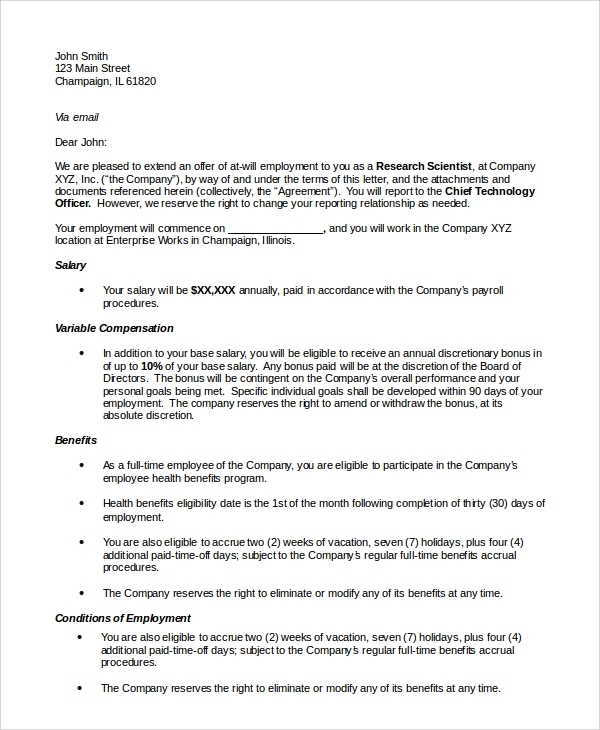 An offer letter marks the relationship between an employer and an employee. These letters convey the brand image to the prospective employees. So, when you write an offer letter to recruit an employee, make sure that you include all the essential elements in it. 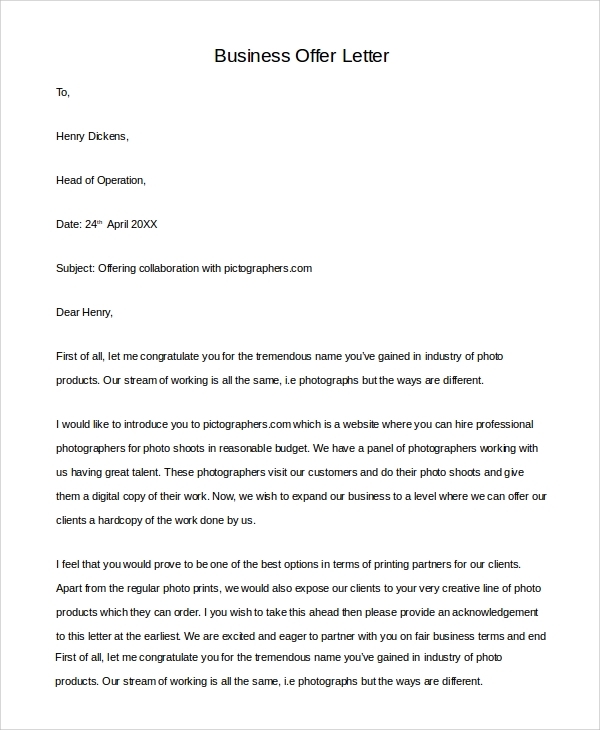 You can follow the format given in the Offer Letter Samples below and this will help you to format the letter. 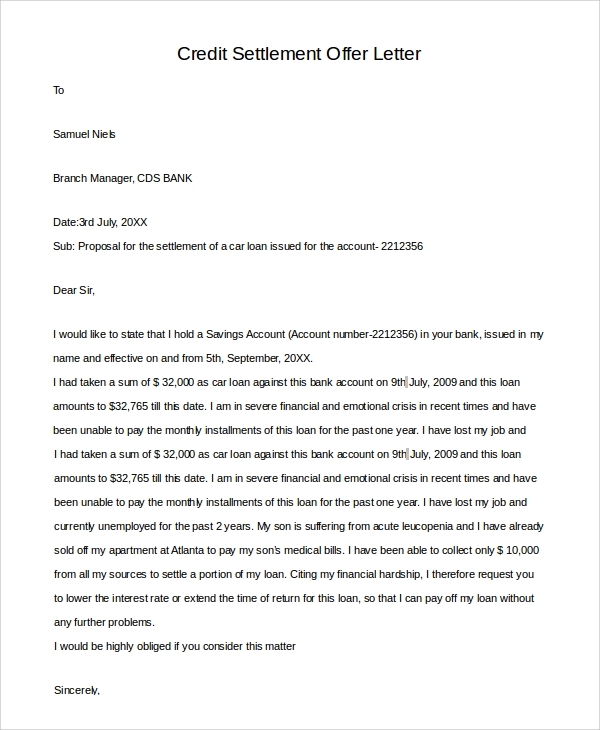 These Sample Letters will assist you in crafting an elegant offer letter. This is a response from the employee to the recruiter, after receiving the job Offer Letter. It is targeted to influence the employer with a positive impression about the employee’s profile, and the willingness to work together. 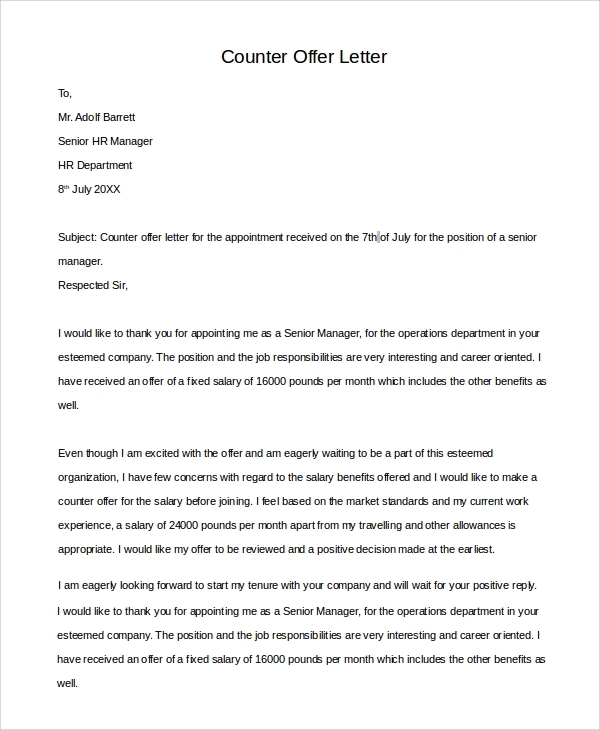 These letters are written by the employer to the candidate after selecting him for the profile. It also specifies that the company has certain policies and urges the employee to go through these. 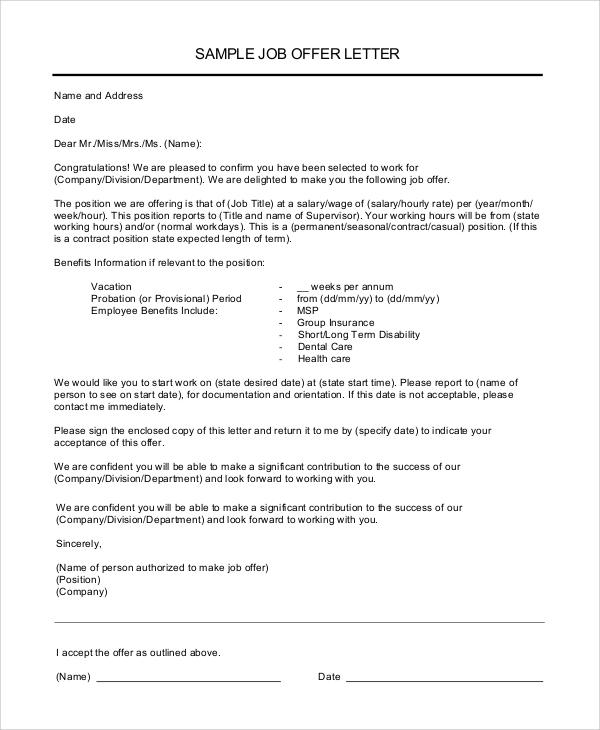 This is a detailed job offer letter that contains all the relevant information about the duties and benefits of the employee. The particulars like duty hours, salary and bonus are stated along different heads. Why is the Appearance of an Offer Letter Important? 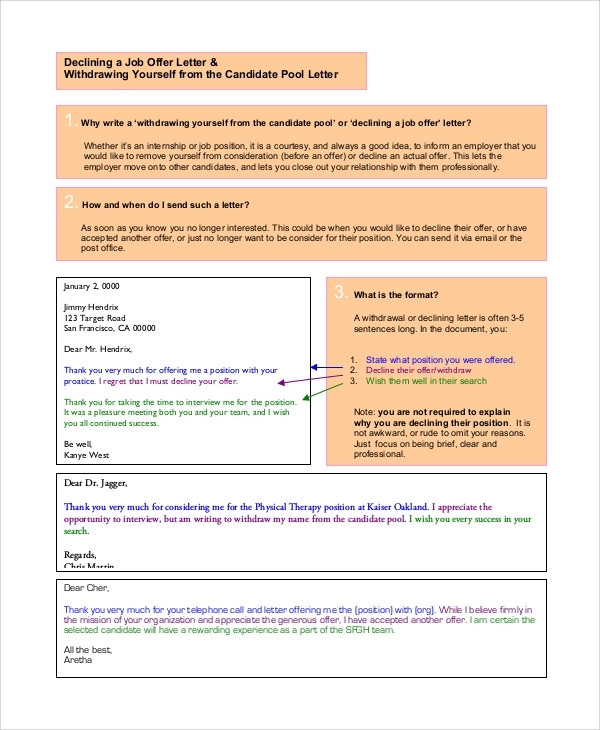 Sample Offer Letters performs more functions than just recruiting a professional. It conveys the message about the taste, preference and culture of the organisation. It also helps to develop a brand image through the writing pattern. 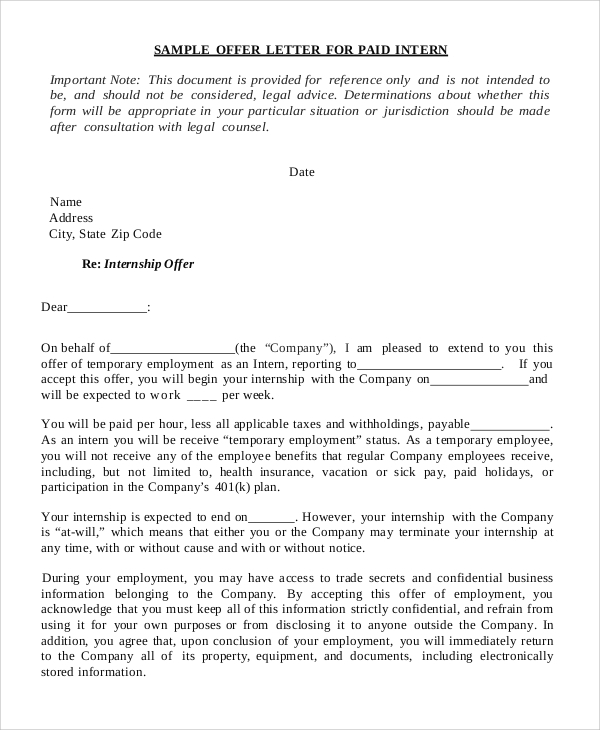 An offer letter also has legal uses and states the terms and conditions of the employment. Companies should mention all the criteria when they send these offer letters. It is recommended that the tone of the letter should be kept positive and direct while writing these letters. Apart from this, companies should refrain from making false promises about the payment, and state the salary it can afford to give to the employees. This Job Offer Letter deals with the rejection of a job offer. You need to be polite with these letters and reason the cause of your unavailability for the job. Finish the letter with a positive and thankful note. 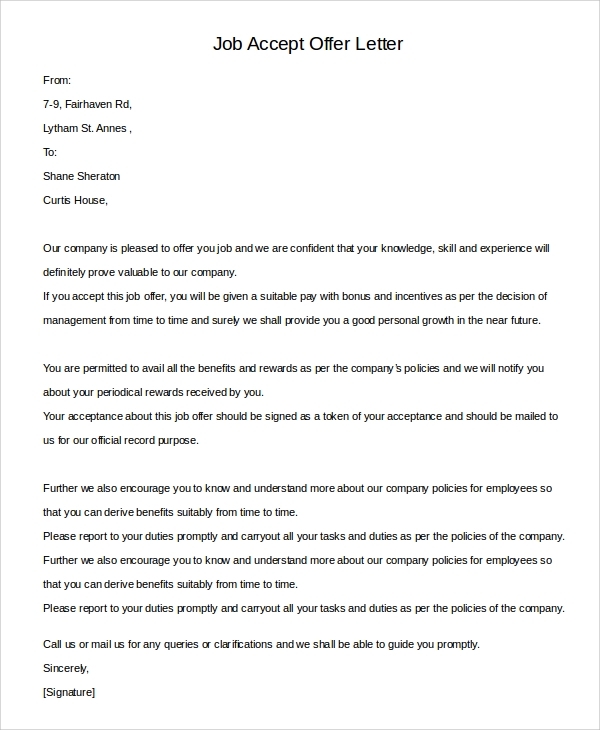 In this letter, the company provides all the details of the benefits to be enjoyed by the employee. The salary, work hours and leaves are listed with bullet points under different subheads. 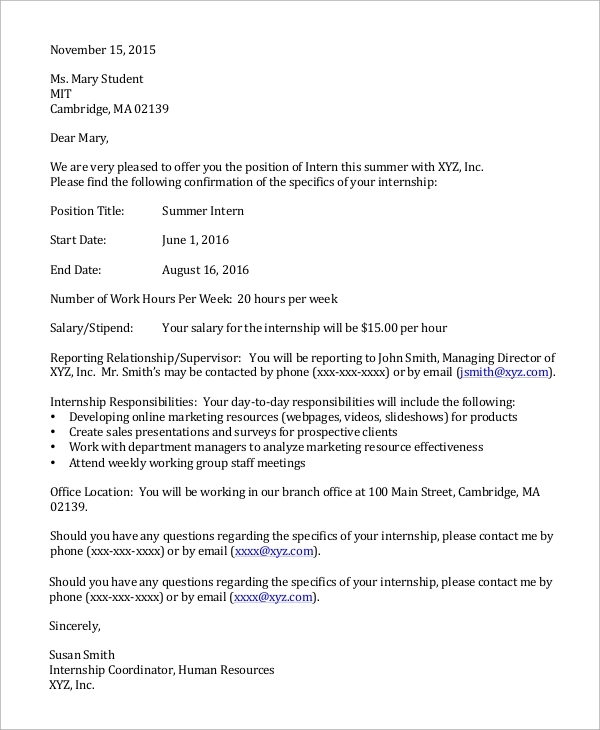 What Information Should You Include in the Offer Letter? In Sample Employment Offer Letters, you need to include all the clauses of the agreement between you and your employee. These include the job position of the employee, the duty hours, salary and other aspects. You need to be clear about the bonus, cash compensation, incentives and benefits that are provided apart from the salary. There should be a particular section dealing with the relationship between the duo. You need to include the stock options and terms on the privacy of information about the company. Along with these, you also need to specify other important terms and policies of the agreement. 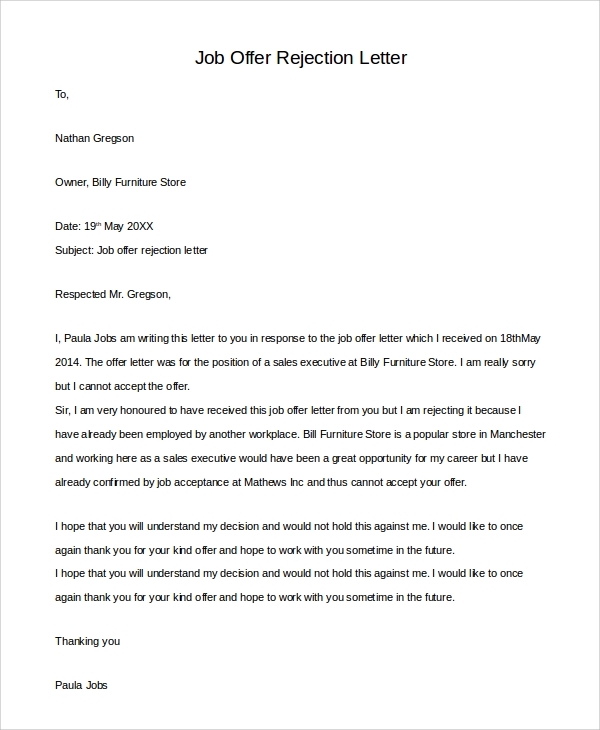 The message and other details in Job Offer Letter have to be crafted with care and attention, as a slight variation from the facilities you can provide will result in legal hassles in future. You can check out the letters in the website and craft the offer letters. You may also find the Sample Decline Offer Letters beneficial.